Angela Shanahan, a devout Catholic and journalist for The Australian, has written a thought-provoking article on the plight of Palestinian Christians. ... in Australia and in most of the West, attention in the media is fixated on the Jewish-Palestinian Muslim conflict. Consequently we have almost forgotten that there are other people in Israel who have long been squeezed in the deep fissures of that conflict: the Christian Palestinians, whose culture goes back to the origins of the Christian church. Palestinian Muslims, of course, owe much to their Christian countrymen and women for bringing the Palestinian cause to the attention of the international community. Prominent Palestinian Christian spokespersons include the late Professor Edward Said and Hanan Ashrawi. 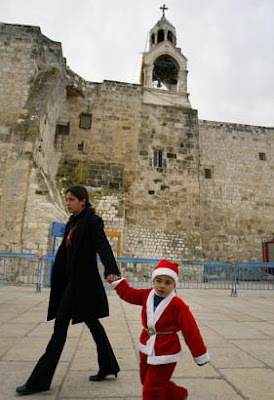 At the same time, Palestinian Muslims are benefitting from Christian institutions. ... Al-Ahliyya College in Ramallah ... is part of the Latin patriarchy's extensive system of schools in Israel and Jordan. These schools educate 20,000 children. Although the schools were founded to educate Christians, Al-Ahliyya has a little more than 40 per cent of its children coming from Muslim families as the Palestinian Christian population shrinks. Palestinians have suffered 60 years of dispossession, 41 years of military occupation, land confiscation and illegal settlements, and thousands of violent deaths. Israelis have suffered 60 years of armed hostilities and constant threats, scores of suicide bombings and rocket attacks, and thousands of violent deaths. Insecurity and polarisation are the chief features of life in Palestine and Israel. For Palestinians, disputes over land, roads, farms, water and military checkpoints go on and on; poverty, unemployment and restrictions on economic development hold sway. For Israelis the ever-present fear of suicide bombers and the threats from other nations in the region create daily anxiety. The suffering on both sides has been acknowledged.